Owning a home in a high alpine environment comes with many daily and weekly chores that don't normally come with a home below 9,000 feet. CaveBuug offers services that perform these tasks so that you don't have to worry about them when you arrive. All you have to do is come up and enjoy your mountain house. Be sure to visit our Resources page to get some information on helpful apps and webpages that send text alerts for hazardous situations like wildfires and snow storms. There's nothing worse than coming up to your mountain retreat and finding a foot of snow in your driveway and an even larger berm of roll-off from the county plowing the roads. In this case, you're likely parking on the road for the duration of your stay and lugging everything, in said foot of snow, from your car to your house that night. There's a solution! 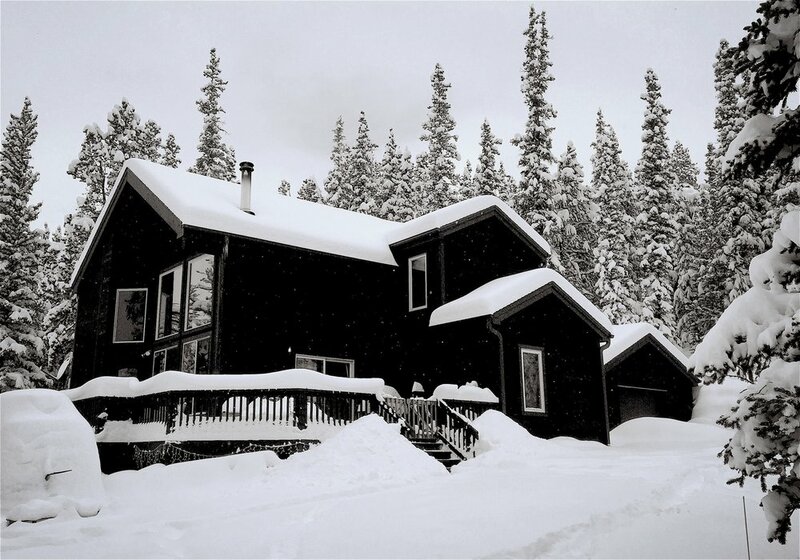 Monthly plowing plans are the best option for a homeowner above 9,000 feet. It's more economical than one-time pushes due to many factors at our elevation: heavy multi-day snowfall, drifting from high winds, roll-off from the county plowing, and slush when everything starts melting. For each of these instances, you're more than likely going to need someone to clear your driveway. Monthly plans will bring us out to clear your driveway in all these situations included w/ your monthly fee. You've got someone plowing the driveway so you can get within a reasonable walking distance to your front door. However, plowing with a truck and blade does not allow for a lot of finesse. It simply is what it is. In this case, you need someone to shovel a path from your cleared driveway to your deck/stairs and have your entire deck--or a portion--cleared so you can open your door and start relaxing. Some folks don't have a need for monthly plowing and just need one-time dig outs. For these, due to how much snow we receive above 9K feet, construction equipment is the only thing that will move several feet of snow that has been through dozens of freeze/thaw cycles. Reach out if this is something you need and we will be happy to help you. Even though you may have the most awesome AWD or 4x4 vehicle, Mother Nature has a way of defeating even the most experienced driver and the most tricked out equipment. This is where trucks with plows and heavy equipment come into play.